Genoa won the openingmatch of the season 2010-2011 by 0-1 against Udinese. The only goal was scored by Mesto in the 81st minute. A cross of Rafinha was headed by Dainelli to Mesto, but the ball was too high and just below him so he could only try to touch it with a bicycle-kick. Mesto succeeded and the ball went besides goalkeeper Handanovic inside the goal at the far post: 0-1. Genoa started the match with the following players: Eduardo; Rossi, Dainelli, Ranocchia; Rafinha, Milanetto, Veloso, Criscito; Palacio, Toni and Sculli. Unfortunately Luca Toni had to leave the pitch during the 1st half with an injury and was substituted by Palladino. In the 2nd half Mr. Gasperini also brought Zuculini and Mesto in the field. As often Gasperson made the right substitutions with Mesto as the only goalscorer. In the last minutes Genoa played with only 10 players because of the injury of Palladino, but our defense was strong, very strong. The first 3 points are ours ! Genoa misses Sassa Bocchetti (99% sure leaves to Russia: Rubin Kazan) and the injured Chico, Kharja, Fatic and Jankovic. The Serie-A season 2010-2011 starts Saturday 28th August at 18.00 hours with Udinese-Genoa. The second match of Genoa is Sunday 12th September in Luigi Ferraris against Chievo. The away-derby is on 19th December and the home-derby on 8th May. Mr. Preziosi again bought 3 players with international experience, 2 of them (Veloso and Rafinha) play in the team of Mr. Gasperini this season, the 3rd Kevin Prince Boateng of Ghana is rent by Genoa to A.C. Milan. Miguel Veloso is a 24 years old midfieldplayer of Sporting Lissabon and the National team of Portugal. After goalkeeper Eduardo another Portugese player in our team who played at the World Cup in South Africa. Márcio Rafael Ferreira de Souza is born at 7th September 1985, so he is almost 25 years old. The Brazilian defender plays under the name Rafinha and was bought of Schalke 04 in Germany which team he joined the last 5 seasons. 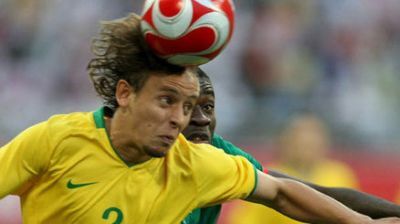 Rafinha also played once in the Brazilian National team. In the friendly match against Athletico Bilbao (Spain) last week which gave Genoa the Tropheo Spagnolo (1-0 by a goal of Luca Toni) Giuseppe Sculli said goodbye to the fans because of his dreamtransfer to Inter. Happily for all Genoa-fans the transfer never became definitive, so Beppe stays another season with us.